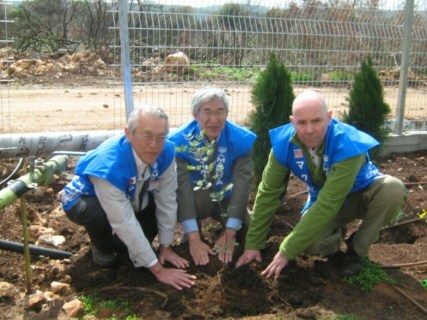 Members of the Japanese-based Makuya movement from both Japan and the United States visited the Carmel Forest in Israel in February, where they planted a symbolic carob tree and paid their respects to the people who were killed in the Carmel fire. The Makuya, Christians who are staunch supporters of Israel and the Jewish people, gave a substantial contribution to KKL-JNF for the Carmel rehabilitation campaign. The Makuya visit Israel every year and march through city streets singing popular Hebrew songs. The Makuya are fervently identified with the cause of Israel, viewing the establishment of the State of Israel and the unification of Jerusalem as a fulfillment of biblical prophecies. “Makuya” is the Japanese equivalent for the Hebrew word mishkan, which refers to the children of Israel's portable shrine in the desert. This name was chosen to express the basic religious orientation of the Makuyas, who emphasize the significance of the personal encounter with the Divine Presence in everyday life. This experience, according to them, must not be substituted by a dogmatic belief in creeds, an idea symbolized by the image of the mishkan, the portable shrine. The Makuyas stress "a return to the dynamic faith of the original Gospel of early Hebraic Christianity." Here's a look at the Makuya arriving at Ben Gurion airport on one of their trips a few years ago. Landing in the middle of the night didn't stop them from singing a rousing version of Hevenu Shalom Aleichem in the airport. Enjoy!